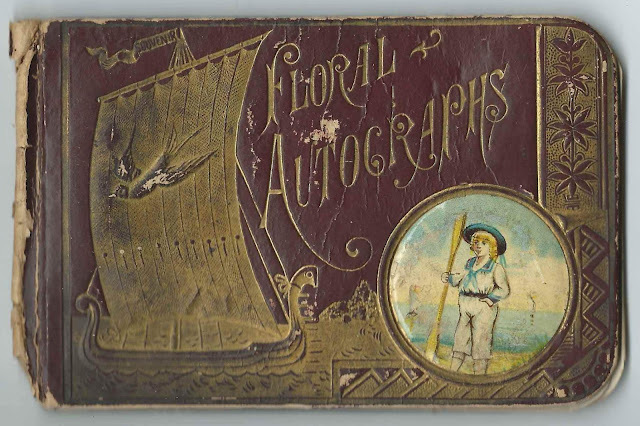 1890s autograph album of Bertha Delight Beckwith (1876-1967) of Woodlawn, Nova Scotia. Bertha or someone else wrote her name on the title page. H. S. Barteau of Berwick, presumably Berwick, Nova Scotia, inscribed the inside cover, left in the image below. The album measures approximately 5-1/4" by 3-1/2" and contains the sentiments of 25 of Bertha's relatives and friends. An alphabetical surname list appears below, and an alphabetical list of the inscribers, together with any personal information they offered, appears at the end of this post. Bertha Alma Beckwith was born at Woodlawn, Nova Scotia, on April 19, 1875, daughter of Samuel Hustis Vincent Beckwith, "Lester", and Jemima (Saunders) Beckwith. I'm not sure when Bertha's middle name became Delight. According to an articles transcribed here and here, Bertha moved to Saint John, New Brunswick for educational purposes, then to Boston, where she worked as a reporter, and then to New York University to study medicine. She started as a nurse, became a physician and served in France during World War I. After she returned to New York, reportedly at least partly due to the pushback she got as a woman doctor, she gave up medicine and became an actress. Whether she returned to medicine or not, I don't know. Bertha died at New York City on August 20, 1967; her stone gives her birth year as 1876. She's buried with her parents and other relatives in the Burlington Cemetery at Burlington, Nova Scotia. If you have corrections and/additions to the information above, please leave a comment or contact me directly. Interestingly, no one mentioned their province when giving their residence. I'm assuming that all of the place names given are located in Nova Scotia.